Cat-scratch disease is an infection you can get after a cat scratches, bites, or licks you. It is caused by bacteria in cat saliva. Cats likely get the bacteria from fleas. Cat-scratch disease is also called cat-scratch fever. It is not a severe illness in healthy people. But it can be a problem for young children or people with weak immune systems. These include people with cancer, diabetes, or acquired immunodeficiency syndrome (AIDS). A red bump, sore, or blister may develop where a cat has bitten or scratched you. This could happen 3 to 10 days after the bite or scratch. The sore or blister may take a long time to heal. You may experience a low-grade fever (under 102°F), headache, fatigue, or poor appetite. An infection of the lymph nodes can also develop. This happens most often in the glands closest to the scratch or bite. If the scratch is on your arm, the glands in your armpit or near your elbow may become tender and swollen. A cat scratch or bite that is not healing. A red area around a cat scratch or bite that continues to get bigger for more than 2 days after the injury. Fever that lasts for several days after a cat scratch or bite. Painful and swollen lymph nodes for more than 2 or 3 weeks. Bone or joint pain, abdominal pain (without fever, vomiting, or diarrhea), or excessive tiredness for more than 2 or 3 weeks. Cat-scratch disease is caused by bacteria that cats carry in their saliva. They likely get the bacteria from fleas. They can spread it to their paws or fur when they lick themselves. You can get cat-scratch disease from a cat biting, scratching, or licking you. You can also get the bacteria in your eyes if you rub them after petting a cat that has the bacteria on its fur. Many people who get cat-scratch disease do not remember being scratched or bitten by a cat. How is cat-scratch disease diagnosed? Your doctor will examine the bite or scratch and ask you about your symptoms. He or she will check your lymph nodes for swelling or tenderness. If a diagnosis is not clear, they may order a blood test. 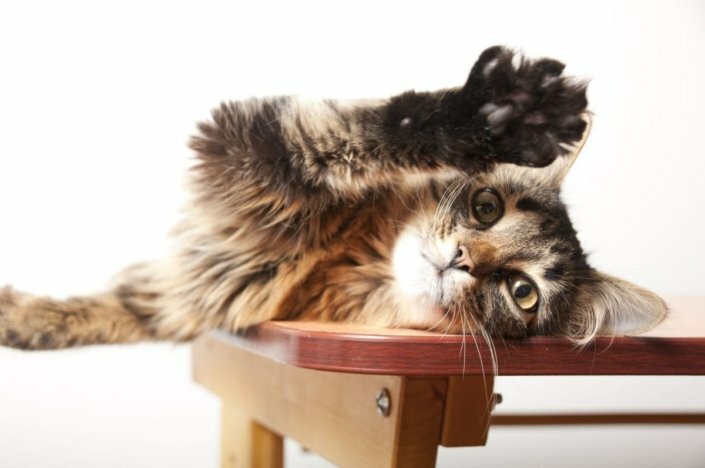 Can cat-scratch disease be prevented or avoided? Wash your hands carefully after handling your cat. Play gently with your cat so they don’t scratch or bite you. Don’t let your cat lick you, especially around the mouth, nose, eyes, or open wounds. Control fleas to decrease the chance that your cat will contract the bacteria. Don’t tease or provoke a cat. Avoid petting stray or feral cats. Young cats are more likely to carry the bacteria than older cats. Households with kittens have higher rates of infection. If the kittens have fleas, the infection rate is even higher. If you are planning to adopt a cat, consider a cat that is at least 1 year old. In most people, cat-scratch disease clears up without treatment. You can take an over-the-counter pain reliever to help relieve pain and discomfort. Ibuprofen (Motrin, Advil) or naproxen (Aleve) can help. Applying heat compresses to the affected area may also help. If a lymph node is very large or painful, your doctor may drain it to help relieve the pain. Antibiotics may be needed if your symptoms don’t go away in a month or two. In rare cases, the infection can travel to your bones, liver, or other organs. This requires more intensive treatment. Most cats with the bacteria do not get sick or need treatment. Rarely, they could develop inflammation of the heart that could make it hard for them to breathe. If you are worried that your cat may be experiencing symptoms from the bacteria, contact your vet. If you get scratched or bitten by a cat, wash the area with soap and water. Look for signs of infection over the next 2 weeks. Call your doctor if you have symptoms. In most cases, you can manage your symptoms at home with pain relievers or warm compresses. My cat scratched me. Do I need to be seen? Is there any way to know whether my cat carries the bacteria that causes cat-scratch disease? My child has a weakened immune system. Should I get rid of my cat? I’ve been bitten by a cat. Is there any way I can keep from developing cat-scratch disease? Information for parents about vomiting and diarrhea in children from the American Academy of Family Physicians.